Even though there are plenty of social implications about what divorce looks like, as far as being highly contested, extremely expensive and fraught with time delays, this is not always accurate in each individual case. Depending on the specifics of your divorce, you may be eligible to pursue what is known as an uncontested divorce. This means that you can avoid many of the common hassles associated with a legal claim to dissolve your marriage. In an uncontested divorce in Florida, this means that your spouse and you have already reached agreement about the major issues in the divorce. This means that you don’t have into the litigation process and argue with one another. Instead, you will sign a marital settlement agreement that outlines what you have come to terms with one another regarding any support payments, child custody arrangements, property and debt division and other details. Your final divorce and the settlement will have to be approved by a judge. The judge usually will approve the settlements very quickly, so long as there are no questions that are raised or any indication that one person signed this agreement under duress. If you are thinking about planning for your finances in terms of divorce, an uncontested divorce is the least expensive kind of marital dissolution to pursue. It is important, however, to be clear about court filing fees and consulting with an attorney. It can be well worth your time to consult with an attorney to ensure that the agreements you have reached with your spouse are fair and equitable and that they represent the best interests for you as well as any involved children. Minor mistakes in these documents could end up being very problematic down the line and you want any opportunity to avoid arguments and further litigation. This is why it is strongly recommended that you consult with a Florida uncontested divorce attorney to have these materials reviewed and to provide you insight about what, if anything, should be changed. You might also look for other materials like books to help you understand the uncontested divorce process, but consulting directly with an attorney is strongly recommended. Why It Makes Sense to Get Help with Your Florida Uncontested Divorce? You might be under the impression that you can handle an uncontested divorce without any insight from an attorney since the very definition of an uncontested divorce means that you’ve come to terms with your other spouse. However, reviewing your settlement agreement and meeting with an attorney can help on more complex issues like child custody. You may also need to consult with an attorney if your spouse or you have retirement benefits associated with work and you may also need to hire an actuary to have these properly valuated. A legal document review and preparation with the assistance of a Florida uncontested divorce attorney can be well worth your time. If you and your spouse are able to come to terms relatively quickly, as soon as the waiting period is over, you may be eligible to receive a final divorce decree. To the best extent possible, it is in your best interest to come to terms on every issue that you can with your spouse. Unfortunately, however, not every divorce will be as simple as an uncontested divorce. You may have long battles over child custody, for example. 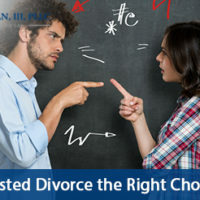 However, if you can recognize the negative aspects of going through extensive litigation both for you and those children, you may be able to work out a compromise with the help of a knowledgeable Florida divorce attorney. Uncontested divorce will make the most sense for you if you are interested in avoiding some of the negative aspects associated with a typical litigated divorce and are concerned about the best interests of any minor parties involved. Regardless of the route you choose to pursue, hiring an experienced uncontested divorce attorney in Florida is strongly recommended. A knowledgeable attorney can help advise you of your rights and prepare you for what to expect in the Florida divorce process. Given that the outcome of a divorce can play such a big role for the future of your life as well as your property and your children, you need to take it seriously by retaining an attorney you can trust.